﻿As a few dozen Marines watched, 1st Sgt. Curtis Rice stood stoic in the intimate courtyard at Camp Pendleton, Calif., as his regimental commander pinned on a Bronze Star medal, its gold “V” catching a glint of the sun. A minute earlier, the crowd listened May 24 as a Marine read the citation for the valor award for Rice’s “heroic example…extraordinary guidance…zealous initiative…total dedication to duty” stemming from his actions in Afghanistan’s Uzbin Valley on July 27, 2009, during a nine-month combat tour – his first in his 16-year career. On that day, Rice, the staff noncommissioned officer with Embedded Training Team 1-11, was returning with his team of about 20 in Humvees returning from a shura meeting when a group of about 50 Taliban fighters attacked a small Afghan National Army post. Afghan soldiers with the 2nd Kandak, 3rd Brigade, 201st Corps, manned the post with Army Special Forces soldiers with an Operational Detachment-Alpha team. Rice, a gunnery sergeant at the time and machinist by training, had spent nearly six years assigned and working in Okinawa, Japan, but intense combat and field training before he left for eastern Afghanistan’s Kabul province prepared him to instinctively react that moment. “He led an aggressive counterattack…, miraculously preventing the position from being overrun and any friendly loss of life,” states his award citation. “During the five-hour engagement, he answered the call as his actions turned the tide in very heavy and close combat with the enemy. “He personally eliminated enemy fighters who were maneuvering on the pinned down combined patrol. He sprinted across open ground while taking enemy fire to resupply a MK-19 team with ammunition and perform remedial actions on an M-240,” it states. As a medevac helicopter approached to evacuate a gravely wounded Special Forces officer, Rice killed an enemy fighter who was about to fire a rocket-propelled grenade at the helicopter. To Rice, the intense, long battle seemed like it lasted “a half hour.” Miraculously, only one member of his team, Marine Cpl. Ethan Nagel, who went thick into the fight alongside the Afghan soldiers as Taliban fighters tried to envelop their position, suffered a shoulder wound and earned a Purple Heart, said Rice. “I received absolutely no wounds,” he added. How Rice landed in Afghanistan on Nov. 5, 2008, to work with ETT 1-11, assigned to Regional Corps Advisory Command-Center, is another story. By the fall of 2008, Rice had spent nearly six years in Japan and had worked for about 18 months as an instructor at the Staff Noncommissioned Officer Academy. Many of his peers – and students – had amassed combat tours to Iraq or Afghanistan. While he enjoyed his work, he felt that something was missing. “I joined the Marine Corps to deploy,” said Rice. And that meant going to the combat zone. Until then, he hadn’t gotten the call. One day, he told the academy’s director, Sgt. Maj. Ramona Cook: “I want to go on deployment.” It didn’t take much convincing Cook, who eventually helped him get orders to leave the staff academy ahead of the usual rotations and deploy overseas with a training team. 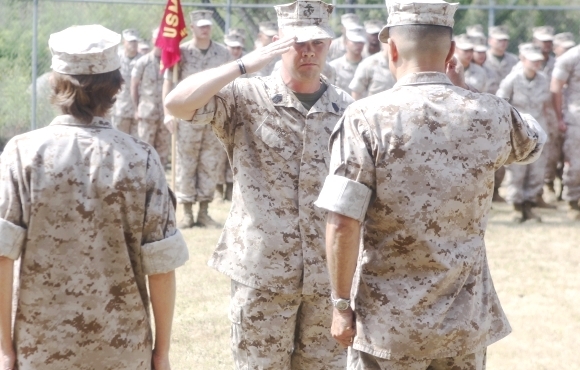 During his deployment, Rice kept occasional contact by email with Cook, now the base sergeant major at Camp Pendleton, but didn’t detail his combat actions or even mention his Bronze Star medals until the day before the ceremony. Rice, who is married, wears a black metal bracelet etched with the name of Maj. Rocco Barnes, an Army Special Forces officer and National Guardsmen with ETT 1-11 who died in a vehicle accident in Afghanistan in July 2009. “A true hero,” Rice said. Thank You for your service and sacrifice, for your country, comrades and corps! Thank you all. For everything you do to keep us safe. Even if it is “just your job”. Thank you for taking it so seriously. goo luck for all marines an Go bless you all. Maj Rocco M Barnes, a true hero died June 4th 2009. Freakin pog got a bronze star for nobody dying on a deployment he was on! His second bronze star was semi-legit, but I know a thousand Lcpl’s who have been in more intense combat. And to my long lost friend Tito (guillermo ramos jr ) I’m glad I came across your name hence I know you’re ok and doing well. God bless all of you who protects the country and our Freedom!